SCS Inspiration Challenge #200 SU BLOG CANDY!!!! One thing to be sure of… if I’m posting a card for a contest, then the deadline to post for that contest must be just minutes away. Yup, here I go again!! This card is for week 3 of the 7 week long Unity Bachelor Challenges. Bro wanted to see some polka dots and plaid. Hope he doesn’t mind that I threw in this big wonderful paisley image, too! *grin* I colored it with markers before stamping which makes it so much easier to use multiple colors. Okay.. I’ve got to run on over to the Unity gallery for this challenge on SCS to upload. You’ll find all the weekly Unity challenges posted each Thursday here. Come on and play. The more the merrier! Fun and cute Susan. I like your faux stitching! Great use of the polkas and plaid, Susan!! I love your pretty flower in the paisley, and all of your stitching as well!! Beautiful detail! Love how you fit the scallops into the curve of the paisley design. Spectacular Susan! Hope you win! Awesome card Susan. Another winner for sure. Very cool card, Susan. Love all the contrasts in pattern and those colors are my favs…red, white and black…always winners. 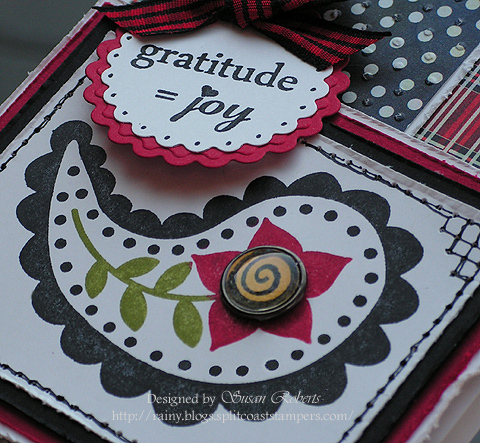 Susan, this is such an awesome card…love the plaid w/all the reds! Fabulous card! I love the combination of the papers! And paisley looks great on this card! Really love the rich colors! Great card! Love the colors, faux stitching and great ribbon! The paisley works for me!!! Oh, how fun! The colors and patterns are great together! Great paper! I love the card. What a pretty card! Love all the patterns!